If you visit my blogsite with any regularity, you’ll notice Johnathan & Tessa, my brother and his wife, have shown up quite a few times. It’s no secret that I do so love photographing them, and I suppose there’s no point in going into the list of reasons why, because I’ve said it all before. But today, this post is not really about them, in particular. Because this past Tuesday, their new little bundle of joy arrived and within a matter of minutes, completely stole the heart of her entire family. Her name is Daisy and she is perfect. And even though I’ll still enjoy photographing her parents (who wouldn’t?! ), I’m glad they want me to photograph her for now. These photos are not really “standard” newborn photos, because we live a good distance from Johnathan and Tessa, now, and I’m not sure if the opportunity is going to arise for me to be able to make it to them for those photos. 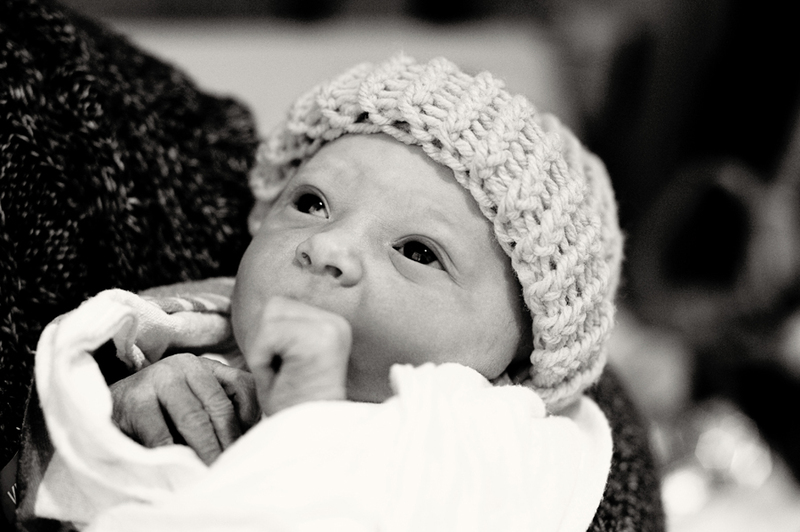 But while they are not “standard” newborn photos, they are definitely brand-newborn photos. She’s still in the hospital and is about 15 hours old in these photos. And, my hope was to give Johnathan and Tessa a gift that was a little more personal than the usual hospital photo. So now I’m sharing them here. Because I can’t help it. Go ahead, see for yourself! Babies are amazing to me. The whole idea that she spent 9 months packaged up and growing inside her mom’s belly…and then she just came out and could survive – just like that. She’s a tiny version of her future self and she’s going to change almost daily for the next several months. 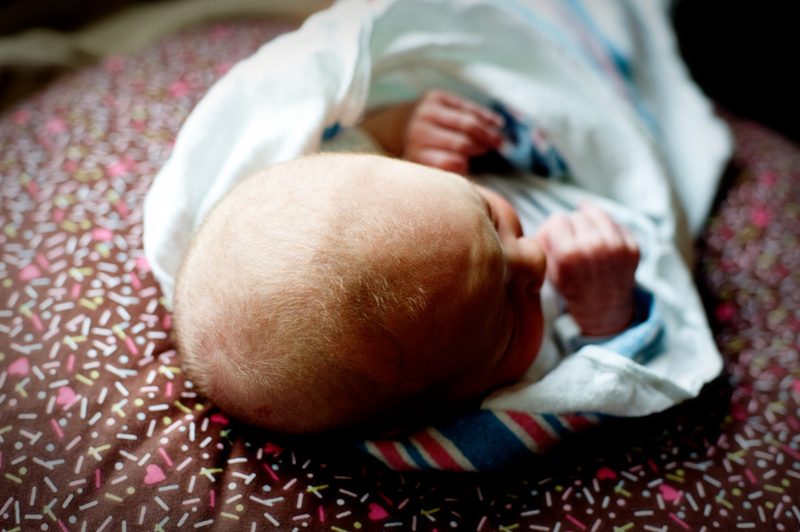 Did you know that newborns can only see sharply about 12-15(ish) inches in front of them? 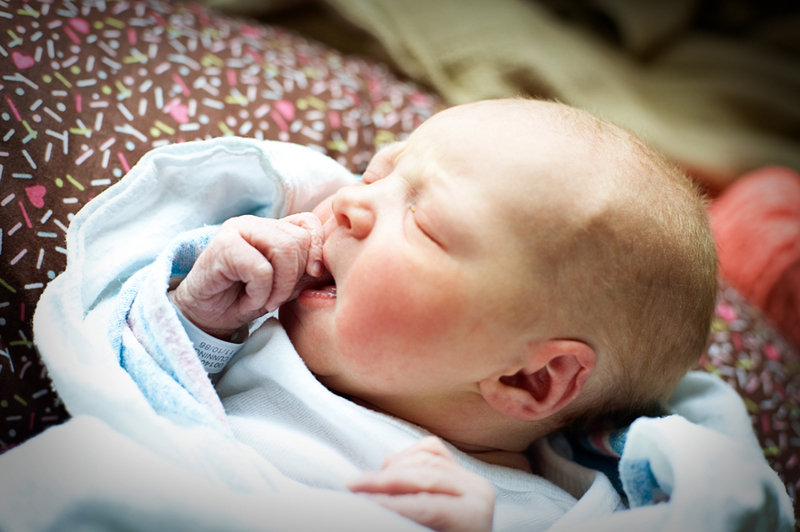 Think about how you usually hold a newborn – in the crook of your arm. That’s the perfect distance for her to focus on your face. Daisy had some great quiet-alert moments, when she wasn’t sleeping. I fully expected her to come out with curly red hair – I’m not sure why, I guess because that’s what Johnathan has. But, when I think about it, he didn’t come out with a full head of hair…so I guess time will tell about her hair. For now, it’s the most perfect covering of peach fuzz. Newborns also LOVE to look at contrasts. This is why you often see them gazing so intently at a human face – our hairlines, eyes, and all the other contrasting patterns on our faces make for such an interesting thing to focus on. I think my camera may’ve been an interesting contrast for her, too. Or maybe I just got lucky that she focused so well for me for a couple seconds. Her little feet were so precious and wrinkly. My 6 year old was very concerned about Daisy’s feet, but I explained that she’d been in her own personal swimming pool for 9 months, so her feet and hands would be a little “pruney” for a while. He accepted that explanation fairly well. Daisy, on the other hand, wasn’t too thrilled with my having uncovered her for a brief second. Johnathan is a dad. Seems like just yesterday, he was being born, himself. I wasn’t allowed to take any hospital photos of Tessa 🙂 – but I thought this one would be okay, since she’s in the background and you can’t really see her. Daisy is now the focal point, anyway. Everyone that saw her was in pretty unanimous agreement – Daisy has “our” nose. Me and my sister and 2 brothers all have the same nose, and now, so does Daisy. At least, as far as we can tell for now. This next photo? My favorite. And I almost can’t get enough of baby hands. Over on my family blog, you can see more photos of Daisy’s hands. I can’t get over her fingers and toes. Tessa is also going to be a great mom. She & Johnathan will be a good team together. And to wrap up, how about one more profile shot? And…back to sleep we go. Congratulations, Johnathan and Tessa! I love all 3 of you! Nova Adams - Thank you for taking and sharing such beautiful pictures of such a beautiful and perfect little girl. Daisy is my 2nd cousin. Her mommy is my 1st cousin. Our mother’s are sister’s. I live in Memphis, TN and I cannot wait to be home for the holidays to meet my sweet little cousin, Daisy K.